Surface pressure, in units of millibars, measured by the Mars Pathfinder lander on the martian surface. Oscillations in measured pressure during a day are caused by the warming/expansion of the atmosphere which follows the sun around the planet and the cooling/contraction which follows the night. Similar atmospheric processes occur on Earth. We interpret the observed variations to indicate the presence of suspended dust over a large portion of the planet and mixed upwards to several tens of kilometers in depth. We resumed complete diurnal coverage with our meteorology measurements at 7 AM on Sol 18, following the successful uplink of a flight software patch. We believe we have seen the minimum annual daily-averaged pressure at the landing site, which apparently occurred on either sol 14, 15 or 16. Our lack of complete diurnal coverage makes this estimation a bit uncertain. We had predicted that the minimum would occur between sols 15-20 of the mission (I erred several days ago in saying we expected an additional 15 sols of decline before reaching the minimum). 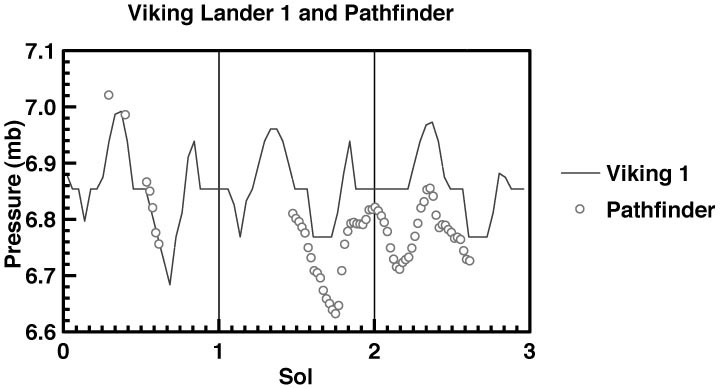 Our estimate was based upon Viking lander 1 measurements from 1976-1982 and upon results from numerical models. The data shown in this and the additional three ASI/MET plots span the time from landing ( ~3 AM on Sol 1) through our most recent data (2:12 PM PM on Sol 23). Martian air temperature, in Kelvin ( 200 Kelvin = -100 Fahrenheit; 260 Kelvin = +8 Fahrenheit), measured by the three thermocouples (electronic temperature measuring devices) located at different heights on the Mars Pathfinder ASI/MET mast. The top mast thermocouple is located one meter above the outer edge of one of Pathfinder's three solar panels. The top of the solar panel is 0.4 meters (16 inches) above the martian surface, which puts the top mast thermocouple 1.4 meters (55 inches) above the surface. The middle mast thermocouple is located 0.5 meters above the solar panel; the bottom thermocouple at 0.25 meters. Since air temperature generally decreases with increasing distance from the sun-warmed ground during daylight hours, the bottom mast thermocouple measures the warmest temperature at those times of day. During the night, the ground rapidly cools and air temperatures are coldest nearest the ground. Thus, at night, the top mast thermocouple measures the warmest temperature. is coming: i.e. a southerly wind is a wind from the south. During the initial sols of the mission, wind direction rotated in a clockwise manner with time: southerly at night, westerly in the morning, northerly during early afternoon, and from the east in the evening. Winds from the south at night are consistent with flow down the Ares Valley at whose northern end Pathfinder is located. The change in the daily wind variation seen to begin late on sol 7 occurs in conjunction with a decrease in the measured sol averaged surface pressure and modulation to its diurnal cycle. Subsequently, we have seen a return to winds rotating through a full 360 degrees during the course of a sol. Wind speeds have still not been absolutely determined from the signals we are receiving from the wind sensor located at the top of the ASI/MET mast. However, our wind sensor signals are strong, and do provide some qualitative information about wind speed (i.e., largest signal as indictaed in this plot corresponds to the fastest winds,...). 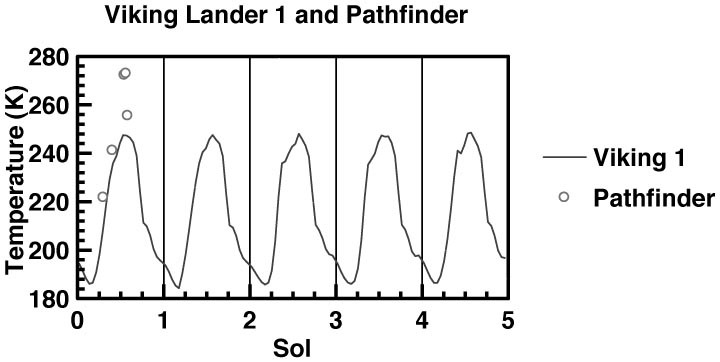 During the mission's initial 10 sols, winds were strong during early morning hours. The time around noon also was a preferred time for relatively strong winds. Weakest winds occur during late afternoon/early evening on most sols. This general pattern of early morning maximum winds has persisted, as far as we can determine from our incomplete diurnal coverage, through to Sol 23. We continue to work towards producing the wind speed data set, and will put the data on this web page as soon as it is available. Surface pressure, in units of millibars, measured by the Pathfinder lander on the martian surface. Oscillations in measured pressure during a day are caused by the warming/expansion of the atmosphere which follows the sun around the planet and the cooling/contraction which follows the night. Similar atmospheric processes occur on Earth. We interpret the observed variations to indicate the presence of suspended dust over a large portion of the planet and mixed upwards to several tens of kilometers in depth. We expect the decline in the daily averaged pressure to continue for another 10-15 sols, after which we expect the pressure to slowly increase. We hope to resume sampling of the full diurnal cycle beginning the afternoon of Sol 15 (Saturday, July 19, 1997), following uplink to the spacecraft of a software patch to minimize the risk of a spacecraft reset. Martian air temperature, in Kelvin ( 200 Kelvin = -100 Fahrenheit; 260 Kelvin = +8 Fahrenheit), measured by the three thermocouples (electronic temperature measuring devices) located at different heights on the Mars Pathfinder ASI/MET mast. The top mast thermocouple is located one meter above the outer edge of one of Pathfinder's three solar panels. The top of the solar panel is 0.4 meters (16 inches) above the martian surface, which puts the top mast thermocouple 1.4 meters (55 inches) above the surface. The middle mast thermocouple is located 0.5 meters above the solar panel; the bottom thermocouple at 0.25 meters. Since air temperature generally decreases with increasing distance from the sun-warmed ground during daylight hours, the bottom mast thermocouple measures the warmest temperature at those times of day. During the night, the ground rapidly cools and air temperatures are coldest nearest the ground. Thus, at night, the top mast thermocouple measures the warmest temperature. 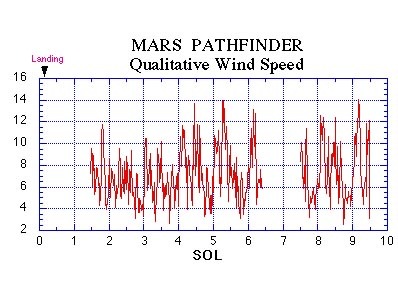 Wind direction at the Mars Pathfinder site is indicated as the direction from which the wind is coming: i.e. a southerly wind is a wind from the south. During the initial sols of the mission, wind direction rotated in a clockwise manner with time: southerly at night, westerly in the morning, northerly during early afternoon, and from the east in the evening. Winds from the south at night are consistent with flow down the Ares Valley at whose northern end Pathfinder is located. The change in the daily wind variation seen to begin late on sol 7 occurs in conjunction with a decrease in the measured sol averaged surface pressure and modulation to its diurnal cycle. Subsequent wind directions suggest that this new patterndoes not persist, but the lack of full diurnal coverage makes any interpretation premature. We look forward to resumption of full diurnal coverage of meteorological observations on Sol 15. Wind speeds have still not been absolutely determined from the signals we are receiving from the wind sensor located at the top of the ASI/MET mast. However, our wind sensor signals are strong, and do provide some qualitative information about wind speed (i.e., when are the winds apparently strongest,...). During the mission's initial 10 sols, winds were strong during early morning hours. The time around noon also was a preferred time for relatively strong winds. Weakest winds occur during late afternoon/early evening on most sols. We continue to work towards producing the wind speed data set, and will put the data on this web page as soon as it is available. Martian air temperature, in Kelvin (200 Kelvin = -100 Fahrenheit; 260 Kelvin = +8 Fahrenheit), measured by the three thermocouples (electronic temperature measuring devices) located at different heights on the Mars Pathfinder ASI/MET mast. The top mast thermocouple is located one meter above the outer edge of one of Pathfinder's three solar panels. The top of the solar panel is 0.4 meters (16 inches) above the martian surface, which puts the top mast thermocouple 1.4 meters (55 inches) above the surface. The middle mast thermocouple is located 0.5 meters above the solar panel; the bottom thermocouple at 0.25 meters. Since air temperature generally decreases with increasing distance from the sun-warmed ground during daylight hours, the bottom mast thermocouple measures the warmest temperature at those times of day. During the night, the ground rapidly cools and air temperatures are coldest nearest the ground. Thus, at night, the top mast thermocouple measures the warmest temperature. Surface pressure, in units of millibars, measured by the Pathfinder lander on the martian surface. Oscillations in measured pressure during a day are caused by the warming/expansion of the atmosphere which follows the sun around the planet and the cooling/contraction which follows the night. Similar atmospheric processes occur on Earth. We interpret the observed variations to indicate the presence of suspended dust over a large portion of the planet and mixed upwards to several tens of kilometers in depth. 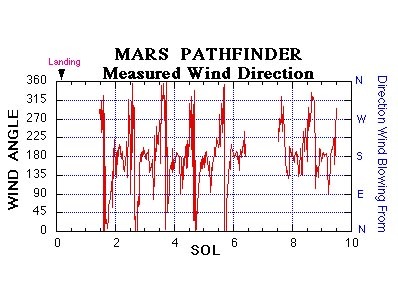 Wind direction at the Mars Pathfinder site is indicated as the direction from which the wind is coming: i.e. a southerly wind is a wind from the south. During the initial sols of the mission, wind direction rotated in a clockwise manner with time: southerly at night, westerly in the morning, northerly during early afternoon, and from the east in the evening. Winds from the south at night are consistent with flow down the Ares Valley at whose northern end Pathfinder is located. The change in the daily wind variation seen to begin late on sol 7 occurs in conjunction with an apprent change in the measured surface pressure. We continue to analyze these changes. Wind speeds have still not been absolutely determined from the signals we are receiving from the wind sensor located at the top of the ASI/MET mast. However, our wind sensor signals are strong, and do provide some qualitative information about wind speed (i.e., when are the winds apparently strongest...). During the mission's initial 10 sols, winds were strong during early morning hours. The time around noon also was a preferred time for relatively strong winds. Weakest winds occur during late afternoon/early evening on most sols. 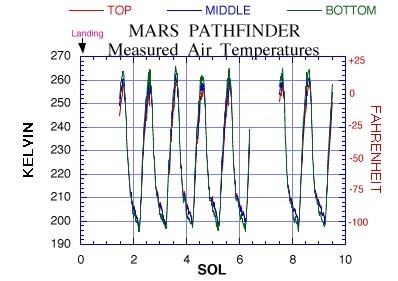 Atmospheric temperatures from the Mars Pathfinder Atmospheric Structure Instrument: This figure presents a preliminary evaluation of the atmospheric temperature structure encountered by Mars Pathfinder during its descent through the Martian atmosphere on July 4, 1997. The deceleration of the probe during its entry is directly related to atmospheric density. Pressures and temperatures can be derived from the density using well-established physical principles. The Atmospheric Structure Instrument measured the probe's deceleration using high precision accelerometers. The temperature profile measured by the Viking 1 lander during its descent to the surface of Mars on July 20, 1976 is shown for comparison. A key debate in the Martian atmospheric sciences community has been over whether Martian climate has changed significantly since the era of the Viking missions. The issue has been whether the lower and middle atmosphere of Mars (altitudes less than 50 km) are "cold" relative to Viking or whether they are "warm" as at the time of Viking. The temperature profile in this figure shows the upper atmosphere of Mars to be quite cold relative to Viking. In fact at about 80 km altitude, the temperature is the lowest ever measured on Mars-- a brisk -275 degrees Fahrenheit. The cold temperatures in this region are not surprising since Mars Pathfinder entered the atmosphere at 3 AM Mars Local Time when the upper atmosphere cools due to the lack of solar heating. 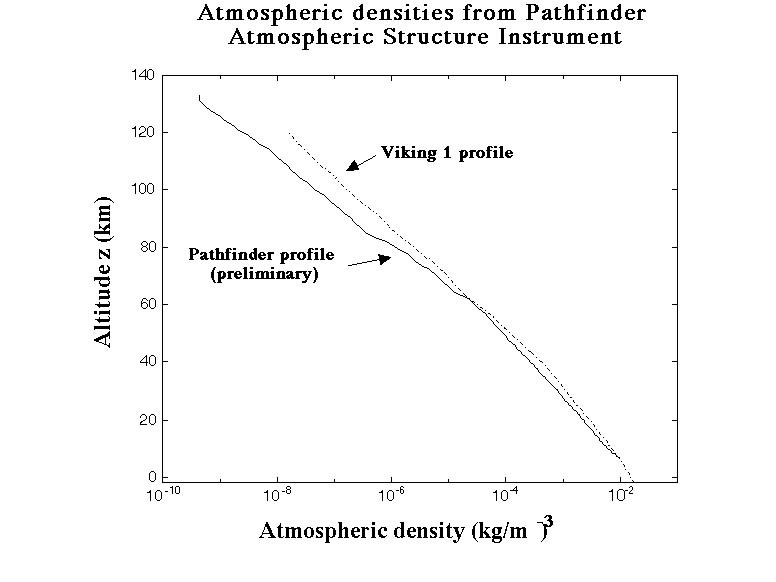 Below 60 km altitude, the temperatures measured by Pathfinder are quite close to those measured by Viking. 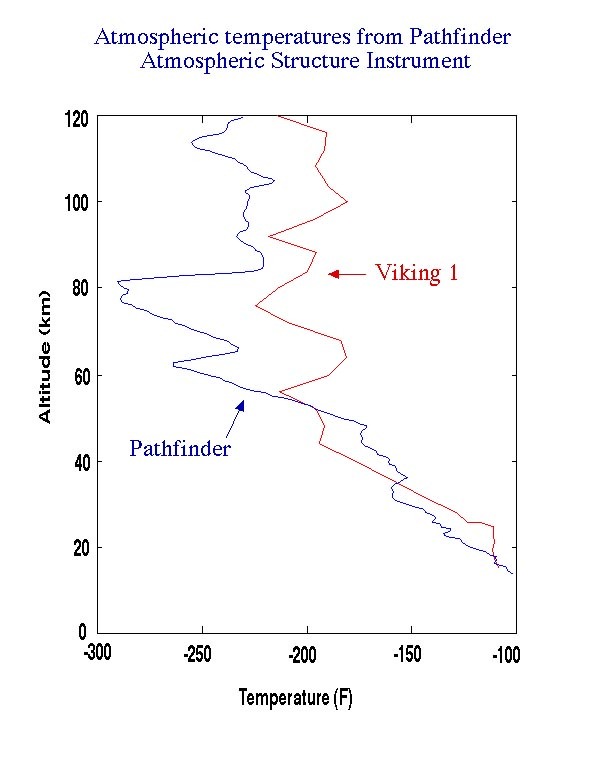 Therefore, the measurements by Mars Pathfinder, which represent one slice through the atmosphere at one location and time, show that the atmosphere is "warm" as it was at the time of Viking. 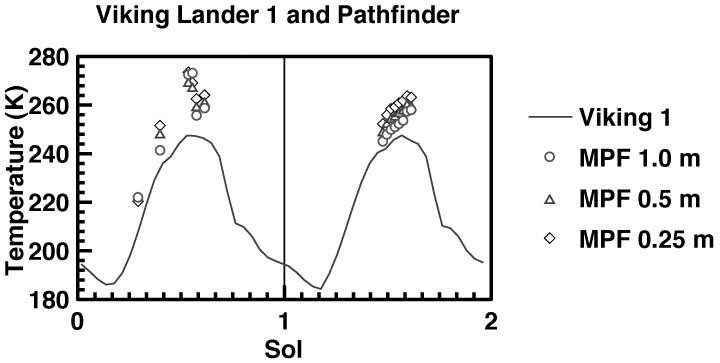 Atmospheric densities from the Mars Pathfinder Atmospheric Structure Instrument: This figure presents a preliminary evaluation of the atmospheric density structure encountered by Mars Pathfinder during its descent through the Martian atmosphere on July 4, 1997. The deceleration of the probe during its entry is directly related to atmospheric density. The Atmospheric Structure Instrument measured the probe's deceleration using accelerometers and these measurements were used in the derivation of this density profile. The density profile measured by the Viking 1 lander during its descent to the surface of Mars on July 20, 1976 is shown for comparison. 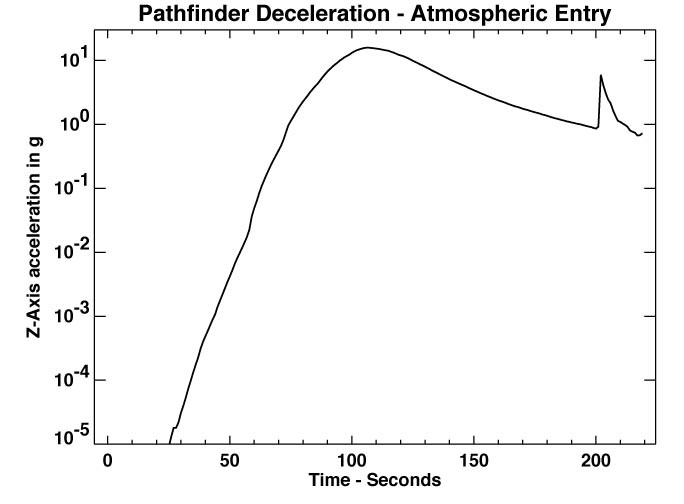 Atmospheric densities above 60 km altitude at the time of the Mars Pathfinder entry are much lower (up to about a factor of 5) than at the time of the Viking 1 entry. These observations of upper atmospheric densities will be important in planning the aerobraking maneuver to put the Mars Global Surveyor spacecraft in its intended orbit starting in September 1997. The densities at lower altitudes also appear to be somewhat lower than those at the time of Viking. Further analysis of these observations will allow the determination of the variation of temperature with altitude. These results provide valuable detailed information on the Martian climate and by comparison with Viking results can provide information on the variation with time of the Martian atmosphere. The Mars Pathfinder ASI/MET experiment is measuring the atmospheric pressure at the Martian surface. 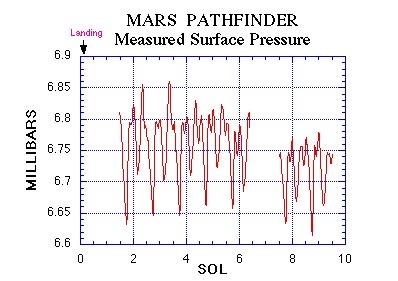 The pressures measured during the first three Martian days (Sols) of the mission have average values near 6.75 millibars. Typical sea-level pressures on Earth are about 150 times larger (1013.25 millibars). The Pathfinder pressures are 10 to 20% smaller than those recorded 21 years ago during the same Martian season (middle northern hemisphere summer) by the Viking Lander 1. 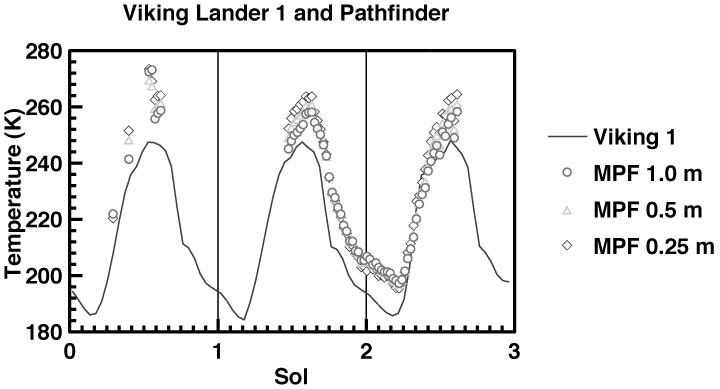 These differences may result from differences in the elevations of the Pathfinder and Viking 1 landing sites. Despite these differences, the Pathfinder and Viking 1 pressure measurements display a similar daily cycle, with minimum pressures near 4AM and 6PM, and maximum values near midnight and 10AM. These daily pressure variations are due primarily to the atmosphere's response to daytime heating and nighttime cooling. The much finer resolution of the Pathfinder measurements (one one-thousandth of a millibar) will aid in studies of small scale weather phenomena which have small pressure signatures. The Mars Pathfinder Lander measures air temperature with sensors located on the Meteorological mast at 10, 20, and 40 inches, (0.25, 0.50, 1.0 meters) above the solar panel. Air temperatures measured during the first three days of the mission show an afternoon high near +14 degrees Fahrenheit (264 Kelvin). [The 270 degree Kelvin temperatures measured at noon on Sol 1 were obtained while the mast was still lying down just above a warm solar panel]. During the day, the air temperatures measured by the lowest of the 3 sensors are 9 to 10 degrees Fahrenheit (5 to 6 Kelvin) warmer than those measured by the top sensor because the atmosphere is heated by the sunlit surface below it. At night, the ground cools more quickly than the atmosphere, and the warmest air temperatures are measured by the uppermost temperature sensor. These temperature differences provide information about the exchange of heat between the surface and the atmosphere. The Viking landers could not determine this quantity directly because they measured the air temperature at only one height (64 inches or 1.6 meters). 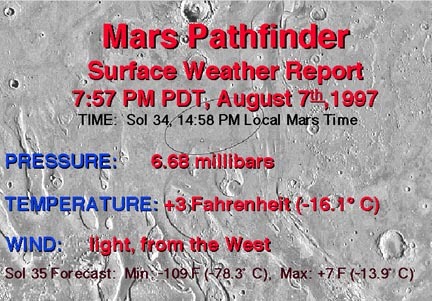 The air temperatures measured by Pathfinder are slightly warmer than those seen 21 years ago at the nearby Viking Lander 1 site at the same Martian season. This may result because the somewhat darker surface at the Pathfinder landing site absorbs more sunlight than the Viking 1 Landing site. The Mars Pathfinder Atmospheric Structure/Meteorology Experiment measures wind speed and direction with a sensor mounted on the top of the 40-inch (1 meter) tall meteorology mast. Measurements made during the late evenings and early mornings of the second and third Sols after landing indicate prevailing winds from the south-south-east. The wind direction then changed in the early afternoon, such that the prevailing winds blew from the north to north-east. 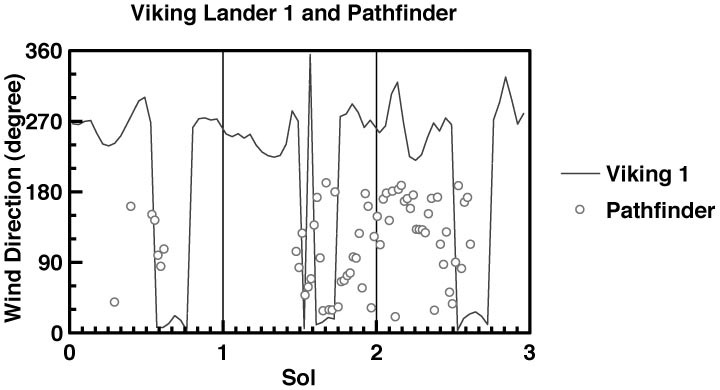 These results are similar to those obtained by the Viking Lander 1 at this season. Wind speeds have not yet been precisely determined, but early estimates show that the winds are quite light (a few miles per hour) during the day, and somewhat stronger (about 10 miles per hour, or 16 kilometers per hour) at night. This figure compares preliminary atmospheric surface pressures recorded by the Pathfinder MET experiment with pressures acquired at the same season and time of day by the Viking 1 lander. Pressure is given in millibars and time is local time of day at the lander site. This figure compares preliminary atmospheric temperatures recorded by the Pathfinder MET experiment with temperatures acquired at the same season and time of day by the Viking 1 lander. Temperature is given in Kelvin and time is local time of day at the lander site. This figure shows the entry vehicle deceleration in g's along its flight path during the entry phase of the mission. As the probe enters at 7.5 km/second, the deceleration forces produced by the atmosphere range from less than 10 micro g at time 0 (160 km) to about 20 g at 100 seconds (25 km). The deceleration pulse produced by parachute deployment is clearly seen at 185 seconds (10 km). This figure shows entry vehicle deceleration in g along its flight path during the entry phase of the mission. 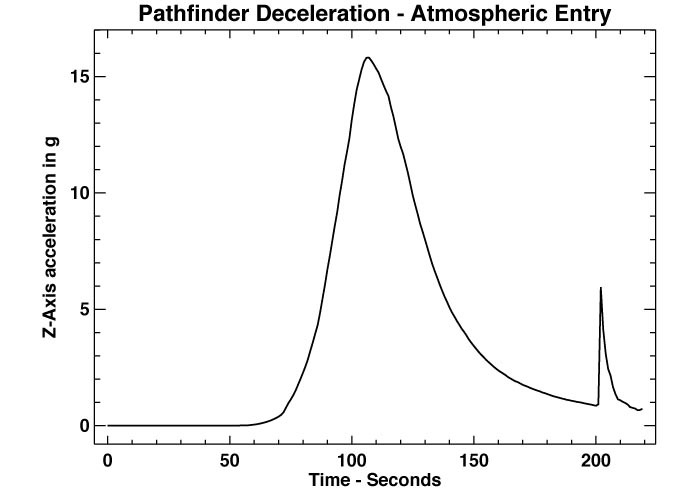 Deceleration is plotted in logarithmic coordinates to reveal accelerations in the range 0.00001 to 20 g. These measurements allow the atmospheric density, pressure and temperature profiles to be calculated.